Every day, pick one small five-minute action and do it. Practice taking action! Want to read more about the advantages of starting small? Read The Slight Edge: Turning Simple Disciplines into Massive Success and Happiness . Having trouble picking where to start? Try this: fill in your list of possibilities and let the ghost in the machine pick for you. How are you doing on New Year’s resolutions? It might be more effective to start smaller and go longer. I’ve tried the “whole life renovation” method and my results have been pretty inconsistent. So I am starting smaller. And yes, it’s still January. So start. Don’t wait until next year. 1. Pick something you’ve been meaning to do. And just for kicks, pick something you can complete in less than 5 minutes. For me, drink more water. 2. Make it stupid-small and very very specific. You’d think “drink more water” is specific enough, but it doesn’t tell me how. It works if I’m standing in front of a water bubbler all day. So I modified it to “fill my water bottle”. 3. Hook it to an existing habit. When am I always in the kitchen, near the bottles and the water? When I make my morning coffee. Bingo. This will work. I thought about this while out for a run. How about take some spring water up to my office? That doesn’t work if I leave the house. I want to make sure I drink the water, not just carry it into my office. So I stuck with the original formulation. And to be on the safe side, I made a Post-It note to remind me. I think I’ll put it on my coffee can. 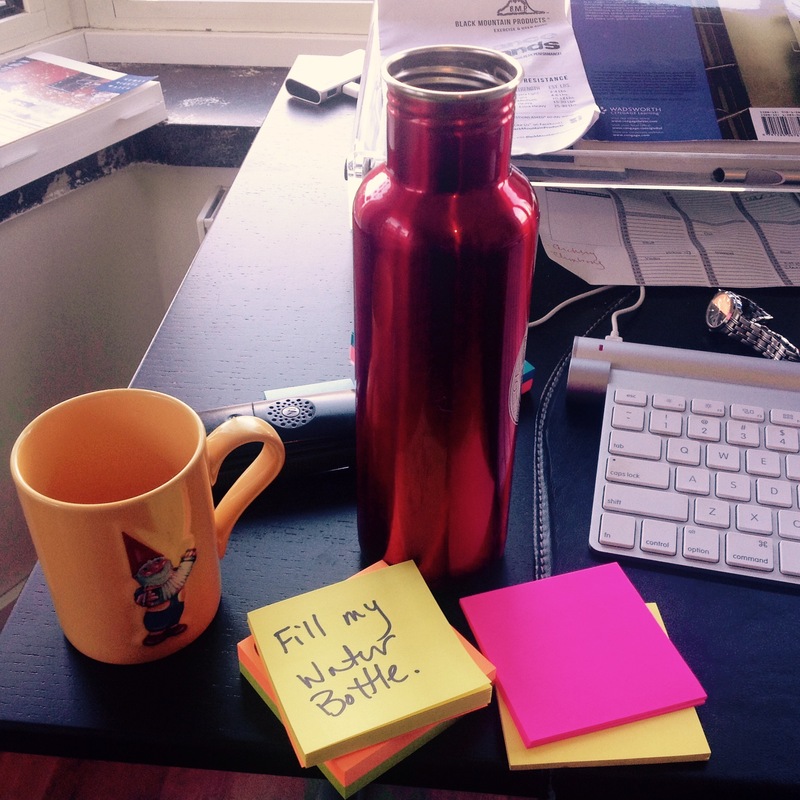 This week’s micro-habit: when I make my morning coffee, fill my water bottle. What micro-habit can you choose that improves your health? Carry on the conversation over at 50 Fit.